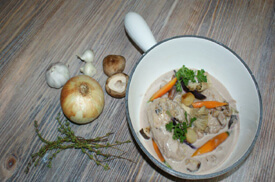 This dish is cooked in Riesling wine, wild mushrooms, baby carrots, pearl onions and much more. Chef Patrice will teach you how to make this dish taste fabulous and minimize your time spent in the kitchen. This class also includes a recipe for Peach Croissant Pudding in a Bourbon Caramel Sauce!